Welcome to our home away from home! Costa Bonita is a relatively new development, built in 2001, on the North end of Mazatlan. 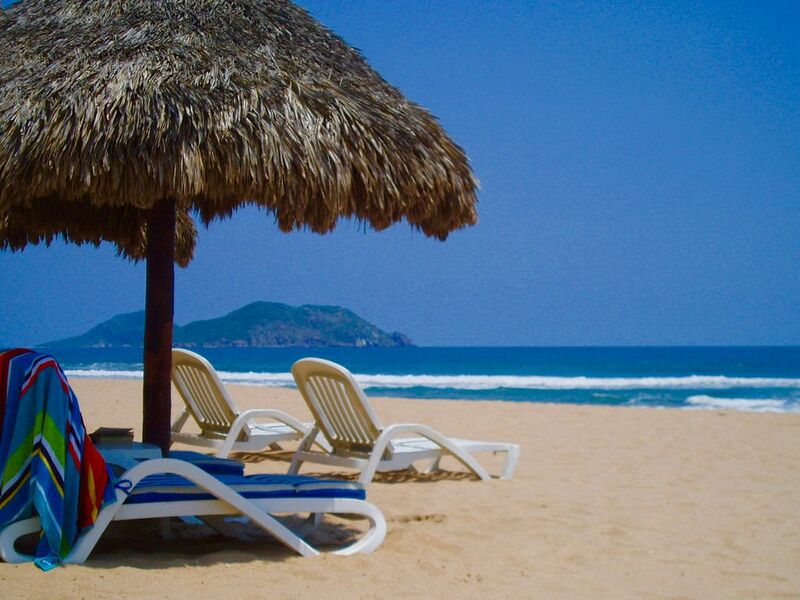 We chose to buy here because it is located on what is considered to be the best beach in Mazatlan, Cerritos Beach. The beach is long and flat with rich, warm sand. There are no rocks and the water deepens gradually allowing the whole family to enjoy the waves. If you are into surfing there is a great point break about 1/2 a mile away. Yes, they rent surfboards! Being at the North end of Mazatlan means that Costa Bonita is quiet. If you've visited Mexico before you may know how important this is! If you are looking for nightclubs and party bars within walking distance then our home is not for you. But, everything you could want, including nightclubs, is only a short and inexpensive bus or taxi ride away. Because all of the units are privately owned you won't find all of the 'resort-type' amenities like para-gliding and sailboat rentals. These activities are available at other locations nearby and the concierge can make bookings for you. The trade-off for not being in a hotel is the quiet, uncrowded, peaceful beach – we’ve never seen more than a handful of people on the beach! Costa Bonita is 'U-shaped' so most units look in towards the pool and beautiful grounds. However, our unit is quite unique in that it is at the front corner of the building, right on the beach, giving you wonderful, wide, breathtaking ocean views. During the day the surf is literally crashing at your feet. Each evening you’ll enjoy unobstructed sunsets and at night the waves will lull you to sleep. It’s a truly amazing experience. When you can pull yourself away from the view, you'll find that our home also offers two bedrooms, each with queen beds, and two full bathrooms, one of which is an en-suite off of the master. The living room has new leather couches, one of which is a sofa-bed, a stereo, and an LCD TV with cable. There is free cabled or WiFi Internet. The full kitchen is large and is well equipped with a fridge, stove, dishwasher, coffee maker, toaster, and a microwave. If you do choose to cook some of your meals you'll find everything you need. Beautiful. Resort very friendly and relaxing. Love it. The amenities in this resort exceed all others. The resort is very renter friendly. Condo is well furnished and well equipped. Very comfortable, great service. In LOVE with Mazatlan ! Condo was great. We used the wonderful "Wizard of Maz" listed here (Linda) and the whole thing was easy and simple. We've made a lot of trips to Cancun, mostly because direct flights from MN were easier. BUT, we will never return there - we're 100% Team Maz now. So much culture, and fun things to do and see... or do NOTHING and sit on clean clear beaches with charming locals and nice friends all over the place. We're very seasoned travelers, and pretty laid back about accommodations and such, but this place really was great. It's a bit further off the hectic scene, and a bit older building than the fancy new places, but very well maintained! The pool was perfect (no loud music! just a barking dog once which security was right on) and the lil' restaurant there was simple and delicious. We rarely return to the same place twice, but within HOURS of arrival we knew we wanted to bring the kids back. It's just a perfect spot for us, very affordable, we felt VERY safe (I worry about everything and was able to relax) and the Playa Bruja scene just down the point was fun and great.... can't say enough good things about this area of Mexico, and the condo & staff. Bueno! Thank you very much for your review. I'm glad that you had a great time and like our place as much as we do! We hope to see you again. We stayed here with my family for Christmas was wonderful. We had plenty to do. My 21 year old son and 18 year old daughter went for the week. Could of not asked for a more wonderful time. We had plenty to do in walking distance there was a great restaurants. We did have to take taxi to get the stores or gold zone it was 10 peso for bus or 120 for taxi. It was beautiful views . The staff was very friendly and helpful. Thanks so much for your visit and for your review. I'm glad that you had a great time and hope that you visit again.